Compressed air treatment is all about how to condition – how to prepare – your compressed air for your plant or workshop use. What is the best bang for the buck when we are talking about compressed air treatment? Do you have an auto-drain installed in your compressor receiver yet? If not, at the very least, you are draining the receiver manually a couple of times a day in the plant, and at the end of every day of use in the home workshop? You see, the fastest and most economical way to get water out of your air system is to drain it at the source, the receiver / air tank. After all, a 250 HP compressor can generate about 80,000 gallons of free water a year. You don’t want that water flowing into your compressed air system air mains. An example of a compressor tank auto-drain is shown below. Much of your down-stream air treatment equipment could be either over taxed, or even rendered useless, if the compressor tank is not drained regularly. How hot is the compressor air tank? Put your hand on the tank after your compressor has been running a while and feel the temperature. If the receiver is warm, and it stays warm or hot all the time you’re using air, your compressor is generating warm, water-vapor laden air, that will ultimately send water from the compressor tank to all the places in your air system where you do not want water to be! To make draining the receiver most effective in ridding your compressed air system of water, the cooler the air is in the compressor tank, the more water will drop out of the compressed air in that tank. This is water which you can eliminate from your system by opening the drain manually or let the your auto-drain void from the tank as it cycles. This is water that will not get to your air tools or air valves and cylinders. Maybe A Larger Compressor Receiver? Consider adding a larger receiver as a passive air cooler. The larger tank does mean that your compressor will run longer to fill the added air space, yet it will also mean that compressed air will have more “dwell time” in the receiver allowing the air to cool naturally and naturally de-water. If the air can cool enough to reach it’s dew point it will condense into free water which can be drained right at the receiver. If you’ve high demand on your compressor, consider adding a second receiver tank plumbed quite a distance from the first, to allow the air to cool naturally as it flows to the second tank. In fact, if your extra compressor receiver was placed on the other side of the plant, and you ran your main air lines from the first compressor receiver up to the ceiling and around both sides of the plant, you’d have a “ring” supply of compressed air, which is the recommended method of plumbing air throughout a plant. 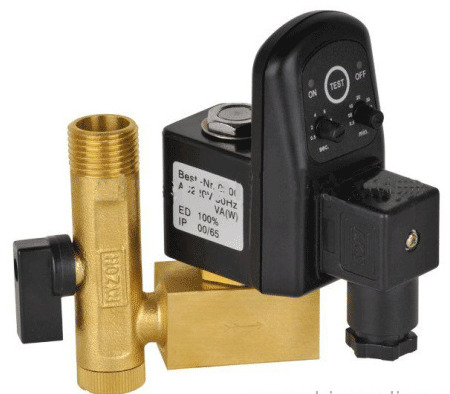 You will have to take into account where and what the demand for your air is and ensure that the added plumbing doesn’t “starve” any application. By having that second receiver installed, you can manually drain the first tank daily, auto-drain the second automatically a number of times each day, and remove substantial amounts of water at the receivers rather than later down-stream where the water can cause you problems. Consider installing an auto drain in both receivers eliminating the worry about a manually drained receiver being forgotten and filling up with water. The second receiver offers an alternate, energy-consumption-free method of naturally cooling air from your compressor. If your compressed air travels from the first receiver to the second without being used in between, immediately after your secondary receiver – and before the air gets to any of your in-plant applications, install a general purpose filter sized for the expected demand of the plant to pull any free water from the air stream as it exits the tank. Depending on the size and capacity of your receiver, the general purpose filter must have the flow capacity of the total flow demand of your plant, not just what the compressor output is rated for. If it’s possible for all air consuming devices in your plant to come on at the same time, that’s the flow that will be moving through the first filter so make sure the filter has the flow to handle it. Space being available, install a first general purpose filter right at the tank, and then a second one as far away from my last receiver as possible, to allow air flowing to it from the receiver to naturally cool in the longer flow path, allowing more water to condense and be removed. There are many additional steps that can be taken to remove water from your compressed air, each one usually more complex and costing more in up-front purchase, and energy consumed to operate them. The intent here is to give you options that allow you to improve water removal in your system to a level that suits your needs, at the lowest possible cost. Not everyone needs air that’s desert dry, and since it costs a small fortune to get larger quantities of compressed air to that level of dryness, you will not want to do so if your plant applications don’t require it. We’ve touched on the use of additional receivers to help in the natural cooling and de-watering of your compressed air. Let us now give some consideration to the overall plumbing in your plant and how following some fundamental rules will help in your compressed air treatment and reduce free water in the air lines. We know that compressed air cools as it travels, and as it cools it often reaches its dew point, the point where water vapor condenses into free water in your air lines. And we all know that gravity works, right? Why not plumb your plant so that gravity works for you? Compressor generated water flows downhill too! When water condenses in your compressed air lines, (it is almost inevitable that it will) that water can be removed from your air lines through sensible plumbing rather than it flowing into your end applications and causing all sorts of problems. Get the water out before it gets to your air tools, your air valves and your cylinder / actuators, and there’s no more problem. I recommended earlier that as the air exits the compressor receiver, that it should flow through an appropriately sized compressed air filter and then straight up to the ceiling in the plant. Rather than using an elbow to turn the line up, consider installing a Tee. Install the Tee so the two ports are vertically oriented. Plumb your air line from the top port up to the ceiling, and plumb a line from the bottom port to either an electric or float type auto drain. Plumbed this way, as the compressed air climbs up to the ceiling in the plant, it will start to cool, and, as it does, water will condense. The water will flow back down to the drain at the bottom of the vertical line. The float type or electronic auto-drain will automatically expel the collected water. When the ceiling-height air main is installed, ensure that all lines have a gentle slope to the farthest end of the plant from the compressor. As air flows around the plant it will cool further and free water will form. Having the entire ceiling line on a gentle slope to one location will allow all the water that condenses in that ceiling main to flow to one location and flow down one drop leg to an automatic or float type drain near the floor. Water flowing down all drop legs? But what about all the other drop lines? Won’t the free water in the mains run down all of them? Not if you take your drop lines off the top of the air mains as shown in the next graphic. Rather than free water running down each drop leg to the machine, water that collects in the mains now will only run to the one location in your plant. All the water that collects in the air main will then flow down one drop leg to be drained regularly at the bottom. Yes, it is extra work and cost to plumb your drop lines as shown in the drawing. The upside of installing the air mains with a water-reduction orientation is a reduced maintenance on the machine and a reduction in machine down-time to perform needed maintenance. Over the longer haul, plumbing properly will save equipment wear and tear, frustration and money! The main air lines at your plant ceiling, if at all possible, should be in a ring, so that the water-removing designated drop line can pull water from two directions. If your plant has an air ring, then any one drop leg for air can pull air from both directions, reducing the potential for compressed air starvation at that machine. Each step of compressed air preparation that we’ve covered so far has advanced us systematiclly towards removing free water from your air lines, involving natural cooling of the air in the lines. The air in your receiver and air mains has been reaching it’s dew point, and more and more of the air vapor in your compressed air has been condensed into free water and removed using the methods discussed. Sometimes natural water elimination from the air tank and mains does not provide dry enough air. That being the case in your plant, it may be necessary to add after-coolers or refrigerant driers. There’s more info about these on this site too.